1. 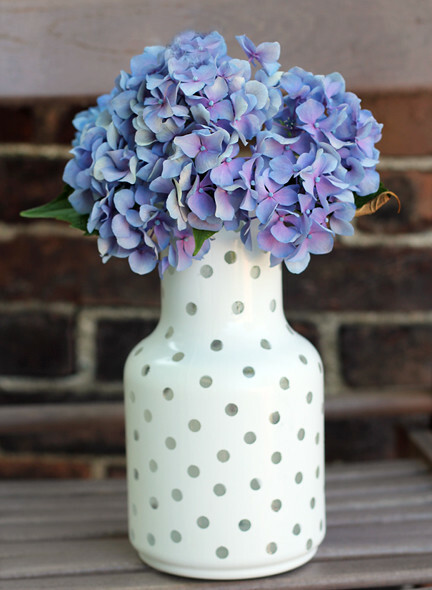 Place office dots all over your vase. I got mine at Goodwill for a dollar. 2. Spray paint vase desired color. 3. Allow ample drying time! 4. Carefully remove dots with tweezers. So, if I had to rate this project, I'd only give it about a 3.5 out of 5. Why, you may ask? The first mistake I made was spray-painting the vase on its side. This was a bad idea because spray paint somehow made it underneath, sticking the vase to the newspaper I was working on. I hid it the best I could with another coat of spray-paint. The second mistake I made was not allowing for enough drying time (damn my impatience). Combine that with the fact that office dots just aren't meant to be easily removed and I ended up with some very jagged edged circles. From a few feet away, the vase looks quite charming, but get any closer and it's much too messy for my liking. The perfectionist side of me wanted cleaner results. Nonetheless, this will be a cute addition for the that porch dinner party I've been wanting to have before summer draws to a close. If I try this again, perhaps I will attempt it with vinyl dots.